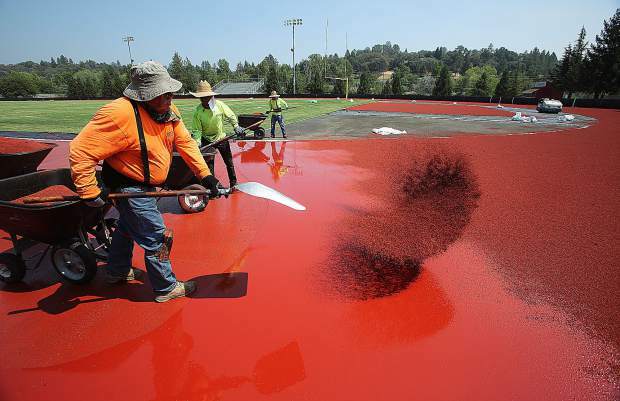 Track installers from Beynon Sports spread layers of specially ground polyurethane pieces into place on the new track at Bear River high school last week. The track and other school improvements were made possible through Measure B, passed in 2016 by Nevada County voters. Bear River High School’s athletic department has a brand new, eight-lane track to train on and share with the community. Construction on the track began in March, and the final coat was applied in recent days. The next step will be cleaning up the peripheral area and striping the track, which is expected to happen next week. The track became reality with the help of funds allotted to the school following the approval of Measure B, a ballot measure passed in 2016 allowing the Nevada Joint Union High School District $47 million in bonds to upgrade and improve local high schools. Bear River Principal Amy Besler said the track accounted for approximately $1.6 million of the allotment, with about half of that cost going toward upgrades to stadium access, repair of underground piping and drainage issues, and Americans with Disabilities Act parking spots. Longtime co-head football coach and newly appointed Bear River Athletic Director Scott Savoie said the school is eager to put the track to use. Savoie said with proper care the track should remain in good condition for many years to come. He said Nevada Union recently resurfaced its track after approximately 15 years of use. In addition to the new opportunities the new track presents Bear River athletics — Savoie said the school hasn’t hosted a track meet in years — he is excited that the community who approved Measure B will get to share in the enjoyment of the school’s new feature.